Mod: Yet another story the fake news media is refusing to cover because it portrays a Trump family member in a positive light. Ivanka Trump Distraught After Learning Detained Migrant Children Completely Without Sewing Machines (The Onion link): While being briefed on the inhumane, unsanitary, often abusive conditions in facilities housing more than 700 immigrant children who have been separated from their families for months on end, White House advisor and first daughter Ivanka Trump was distraught to learn Thursday that none of the detainees from ages 1 to 12 had even the most basic access to sewing machines. “When I think of those poor kids, caged so far from the factories where they belong, it just breaks my heart,” said Trump, as her chin quivered at the mere thought of the hundreds of young children who had been stripped of their right to make designer bags, shoes, and clothing. “These poor little children have the ideal hand and finger size to make small, precise stitches in profitable designer clothing, and any decent sweatshop should be able to find more than enough room for them. 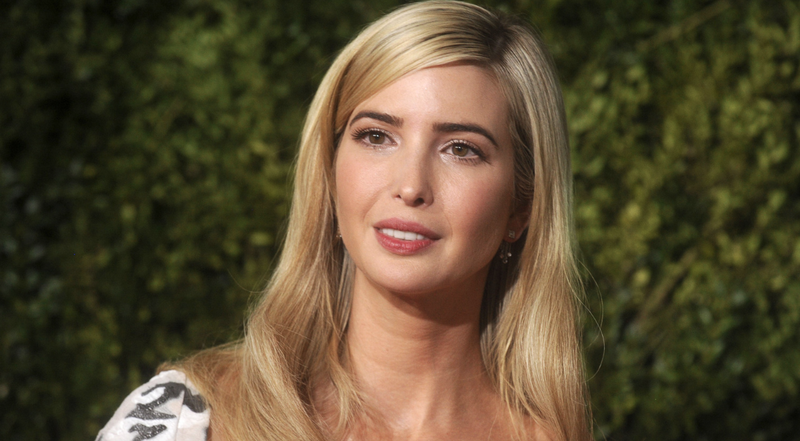 Ms. Trump later announced the establishment of the Ivanka Trump Collection Foundation, which will donate thousands of dollars’ worth of garment-making equipment to ICE. This is very sick news. What a Mad Magazine approach to inhuman treatment of families. This is disgusting to think that families are separated like animals going to the slaughterhouse. This administration is the worse America has ever been stuck with. What kind of news agency would even write crap like this? America has set itself up to be nuked, and the rest of the world will be happy about it. Sick sick people. All hell is about to break loose. The Republicans in the US Senate and the Republicans in various Intelligence agencies have gone around Donald Trump. The Senate passed a bill that requires a two/thirds vote in the Senate before we can leave NATO. It was a direct reaction to Donald Trump's recent trip to Britain and the EU. They finally see the danger that is sitting in the White House. Also, it appears that the NSA Director, the FBI Director, the DNI, the Director of Homeland Security, the National Security Advisor, all came out for a news conference today to try and reassure the people that they are aware of the attacks that are in progress against our election system, and they did it without the approval of Donald Trump, their President. It appears that Trump has lost all credibility with much of his own Party. Just when he is in full-out assault against his Attorney General, his Justice Department, and the Special Counsel. He has gone completely off the rails in the last few days. A bipartisan group of senators is introducing legislation to impose "crushing" new financial penalties on Russia. The bill would slap new sanctions on Moscow, require two-thirds Senate approval if President Trump wanted to withdraw from the North Atlantic Treaty Organization (NATO) and force the State Department to determine if Russia is a state sponsor of terrorism. GOP Sen. Lindsey Graham (S.C.) said current U.S. sanctions against Russia haven't stopped Moscow from trying to meddle in the November midterm elections, despite Congress passing new legislation last year. The comments left here are just as funny as the Moderators article. It does a body good to have such levity so early in the day. Keep up the good work. Don’t sanctions against Russia hurt the Russian businesses of Russian Asset Trump? No, the Trump International Tower is still scheduled to replace the Hotel Shirley, and the new golf course and condos will replace the Monastery. This is too true not to share, thanks for looking and turn the volume on so you can here it. Two thirds vote from the Senate 6:31am and sponsored from Senator Lindsey Graham no less, ha like that bill will ever get passed! By the way, President Trump has already imposed everything you just spent time posting. Sure he did. Trump is Putin's little puppet. Comment at 8:10 makes sense—but only in the original Russian. "By the way, President Trump has already imposed everything you just spent time posting. "So the sewing machines are on the way to Texas? I am guessing here but it appears some Real Americans are tired of eating cake? Instead they are about to take matters into their own hands just as the French had to do in the 1789.
https://en.wikipedia.org/wiki/French_Revolution Down with the tyrants (GOP) fools in 2018. A lot of us are hoping our system will protect us from this lunacy, any day now would be fine! We have a sewing machine to donate. Good shape, maybe used 10 times max. Trump Attacks Press Again at Pennsylvania Rally: 'They Are Fake, Disgusting News' That is a guy that knows fake news when he sees it. Presidential promise; a sewing machine for every household. Thank you for reminding us that Obama’s rescue of the economy is still going strong and hasn’t been completely ruined by Russian Asset Trump yet. A great many of us are hoping the system will be repaired in time, having been dismantled over these many years with Presidential wanabe's that made promises just to get the job and never delivered on anything. I miss obama- that guy got it done. Finished bin laden. Restored America’s standing among nations. Rescued the economy. Healthcare for all. Controlled runaway military spending. Improved diplomatic relations with former adversaries. We need to donate one, maybe two states, to the crazies. Then build a really good wall. Rosanne Barr can be their ruler, and they'll be called the Q States. Maybe we can build a big dome over them. Help them realize their dream of a perverse Deep State that's out to get them. I nominate Alabama and Mississippi. 5:29pm. Thanks for the JOKE OF THE DAY. 6:37 do note what 9:04 and 5:29 said, they are right.